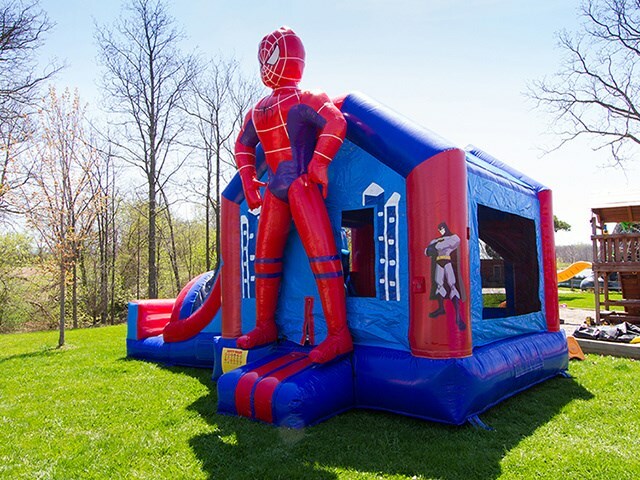 Products - Inflatable Bounce Slide Combos - Spiderman Cartoon Inflatable Jumper With Slide, Inflatable Bounce House Combo Price BY-IC-007 - Guangzhou Barry Industrial Co., Ltd.
Spider-Man to the rescue!!! Boys will love this Spiderman themed combo bouncer. Includes a basketball net inside and a climb n’ slide! It is a great addition to a birthday party or an eye-catcher for that Festival or event! such as inflatable obstacles and a slide. Q1:What are the elements of inflatable combo? inflatable obstacles and a slide,bounce with a slide,bounce with obstacle coure,ect. Q3:Are you a manufacturer or a trading company? Q4:Does your company pass any certificates? Q5: Do you offer some accessories? Q6: How about the warranty? Q7:How long is your delivery time ?